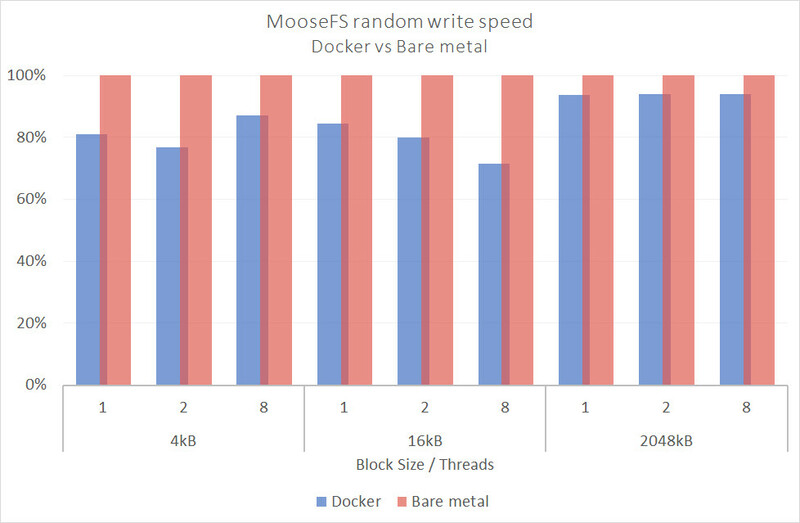 Home | Blog | MooseFS showcases good performance on Docker! MooseFS showcases good performance on Docker! MooseFS showcases good performance on Docker! 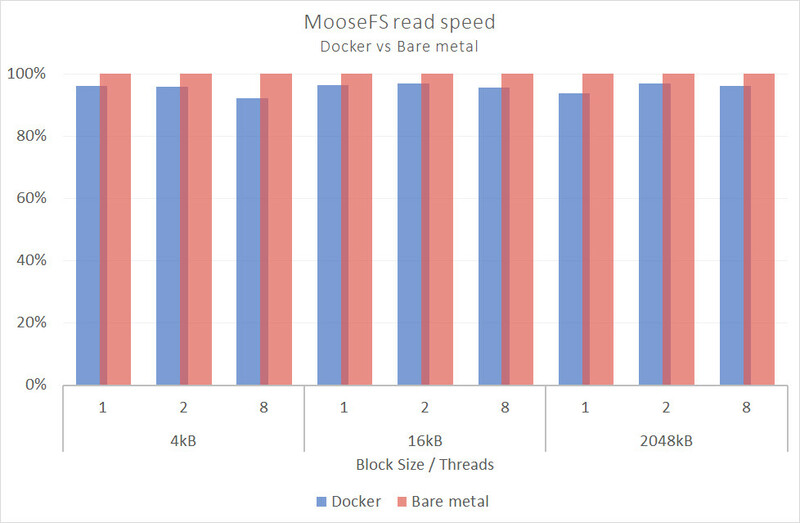 In this article, we show how we tested MooseFS performance on Docker and present what results the MooseFS has achieved. There is one exciting news for all the MooseFS users that MooseFS showcases good performance on Docker containers. So, this means our customers can now deploy MooseFS easily using Docker containers. The tests were performed with Docker 1.13 and MooseFS 4.0 software version but the results are also achievable with MooseFS 3.0.92+ version. We conducted a test, in which MooseFS was run on Docker to check whether rapid deployment of MooseFS can be achieved or not using Docker. The setup consisted of 10 servers, one as a client, two as master servers and seven machines as chunk servers. All the machines were connected in a ring topology using Intel I350 Gigabit Network Connection cards. 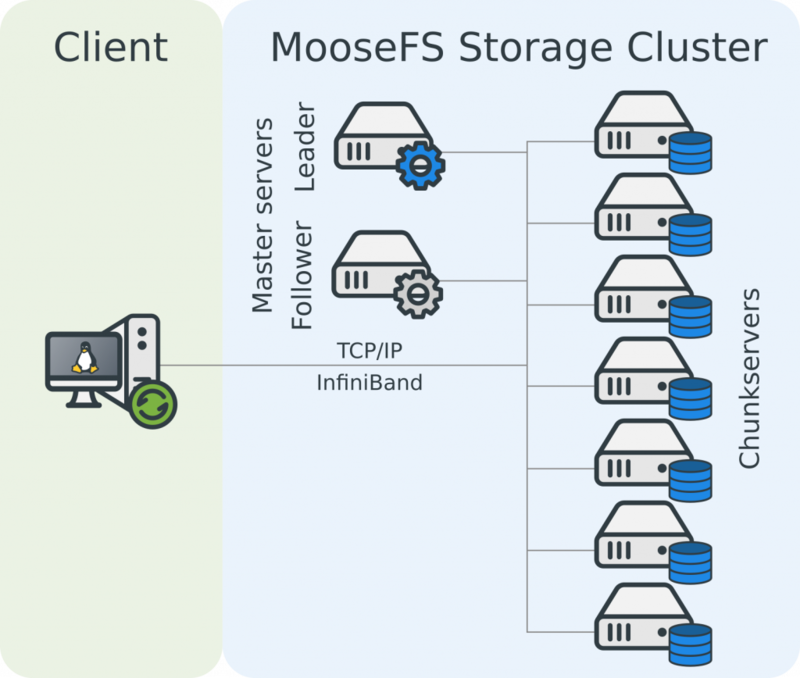 The experiments showed us how the use of containers affected the performance of the MooseFS storage cluster. Results show us that containerized storage is 5-10% slower than bare metal setup. Although, for speed-critical systems, it is recommended to use bare metal installation. However, the Docker based setup is recommended, for the first steps with MooseFS to quickly run on any operating system supported by Docker. Such a setup can also be used to test MooseFS features. Using this configuration one can test MooseFS POSIX compatibility, redundancy, and other features. In this blog, we will first give some information about MooseFS and Docker and then we will explain the set-up and how the tests were conducted to run MooseFS in docker. And then there will be the analysis of the performance of MooseFS in Docker as compared with bare metal with the help of graphs. This blog concludes with scripts and detailed results as mentioned in the appendix. 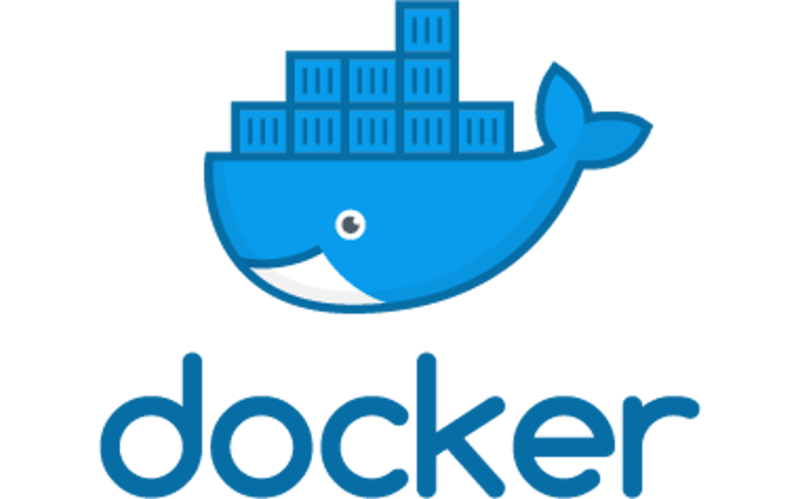 Docker is a container platform which provides an additional layer of abstraction and automation of operating system level virtualization on Windows and Linux. It isolates software which can run on a shared operating system instead of running on full Virtual Machine. Such a solution is more and more popular due to it’s really fast and reliable deployment capability. The following section provides description and configuration details for MooseFS in Docker containers. Only one server was dedicated as MooseFS client. Benchmark was executed inside the MooseFS client mount point. Benchmark tool used in this test was IOzone software, version 3.465. We used 10 servers for the setup, one as a client, two as masters and seven machines as chunk servers (Figure 1). All the machines were connected in a ring topology using Intel I350 Gigabit Network Connection cards. To eliminate hard disk bottleneck, 100GB RAM disks were created on each chunk server. No kernel modifications and no additional components were required. MooseFS replication was set to goal 1. Docker instances used the official Ubuntu 14.04 image from https://hub.docker.com/_/ubuntu/. The following graphs show read/write and random read/write operations throughput with block size 4k, 16k, 2048k and 1, 2, 8 threads. 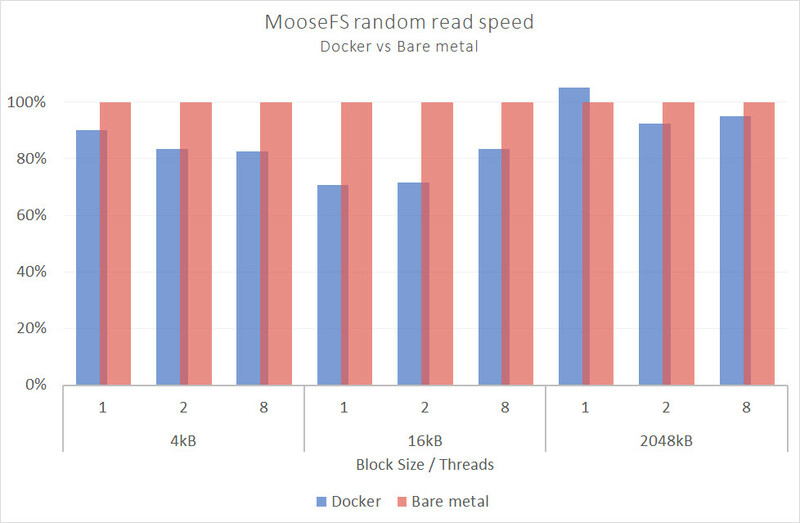 The purpose of this test was to compare the performance of Docker container with bare metal, so the Y axis is scaled such that 100% is the performance of bare metal MooseFS. This section provides Docker scripts and detailed results gathered during all IOzone benchmark tests. The below table shows all the results of performed tests. It includes block sizes starting from 4 kB to 2048 kB and 1 to 16 threads. We hide the results table on small screens. 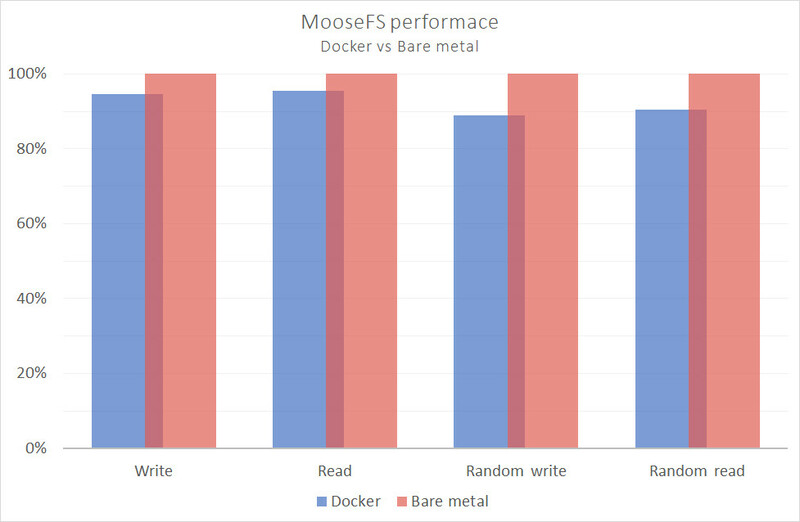 If you want to download this article as pdf, please click here: MooseFS showcases good performance on Docker!